Discussion in 'Marvel Films' started by Ultimate_Superman, Mar 29, 2006. You can't make a valid distinction. Too many different variables, two different genres. Oh, I can decide....and quite easily. Spider-Man is going to win this poll. More popular character, and more enjoyed franchise, at least from who I talk to. Blade will get some votes from the action crowd, but I like more drama in my flicks. In case you didn't figure out, I voted for Spider-Man. Loved both movies in that franchise, where as I thought Blade II was mediocre at best, and Blade was good, but not great. While on Blade....has anyone seen this? I ran across it at Best Buy few minutes ago. They are really trying hard to be deceptive. Look at the weapon in his left hand! No contest at all. Spiderman by a quantum leap. 2 completely different types of movies. But if you're going on entertainment value it's definitely Spider-Man. I might have to rent that Vampire Assassins. Although i really enjoyed and believe that Blade 1 was really cool, Blade to alright, there's no comparison. Spiderman by miles. Stripesy Strip Eat That, Jimmy Olsen! I like the horror element in Blade 1 & 2 so I prefer those films over Spiderman. It's quite clear Spiderman 1 & 2 have higher production values and are better films in many ways but I can watch Blade 1 & 2 over and over and over and over. Can't do that with Spiderman 2. Too slow. I think Spiderman 3 will take the cake though. Agree completely - 2 different genres. Best I can do is say that Blade is better than Blade 2 and Spiderman 2 is better than Spiderman. As a guy who is not a fan of the SPider-Man movies at all, this decision is way too easy. Spider-Man. I think Spidey 2 is vastly overrated. Spider-Man was near perfection though. But I've got to go with the first two Blade movies. Overall I think they were consistently better. I also thought Blade 2 rocked. It was a roller coaster ride from start to finish. Spidey 2 was uneven. The acting and FX were well done. I also liked the Spidey reveal to Harry Osborn and Mary Jane. But there wasn't enough Doc Ock, his last minute conversion was lame, the whole sun thing being doused in the Hudson River was lame as well. And parts of Spidey 2 moved as slow as molasses. I also hated the whole "Raindrops Keep Falling on my Head" stuff. A waste of scenery. Blade 2, on the other hand, despite the sometimes cheesy FX, was lean and mean. My opinion will probably shift to the Spider Man movies after Spidey 3 comes out. It won't take much to outdo Blade Trinity. Someone posted that here awhile ago. That's complete BS that completely using the likeness of a Marvel character and not even trying to hide it. Marvel probably wouldn't bother suing though because it's clearly a DTV release though if it is successful and makes some dough Marvel could clearly have a case. It's not a parody. What a ****in rip-off, atleast make him a different race to not make it so obvious. 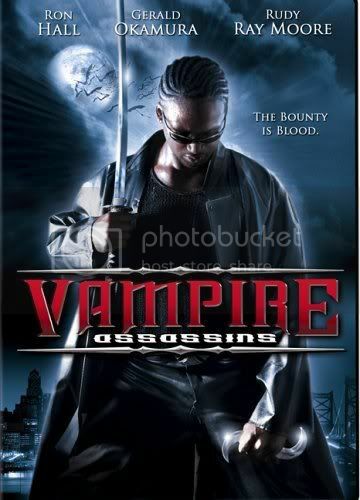 I don't understand how you can act in a movie like "Vampire Assasins" and not feel like a tool... Like as if you're too stupid to realize it's a complete Blade ripoff. Ugh. Oh, and the vote goes for Spider-Man, of course. Its called paying the bills.